I wrote a few weeks ago that our cat has tummy trouble. Every so often she goes through episodes where she throws up once per day (or every two days), and at the same time she’ll have more runny stool. The two go hand-in-hand; when she throws up I know that she’ll have the stool condition for the next couple of days, too. We can’t seem to cure this condition, she’s had it for two years. The best we can do is manage it which means that it still happens, but we try to make it happen less. And in order to do that, we have a routine we need to adhere to. If your cat throws up but otherwise seems normal it’s probably because it has a food allergy. Cats need variety in their diet just like humans. If all it gets is one type of food, that’s probably the problem. First, she gets dry kibbles. We would cut these out but she likes them too much. We get her Indoor Light Royal Canin, plus we mix it with a couple of other types of food. You should be giving the cat stuff that has very little grain in it because cats can’t digest it that well. Second, she gets human tuna (unsalted, in water and not vegetable oil) from Whole Foods. She won’t eat other kinds of wet cat food. We tried multiple types of other canned cat food but she refused to eat it. She sniffed it and walked away. Third, she gets freeze-dried food. This is wet food but has been frozen and dried out; you just add water. The brand she gets is "Stella and Chewy’s". We frequently mix the tuna with the freeze-dried food. Fourth, we also buy wheat grass for her. This is something you can get from a pet store although a regular grocery store may have it (which is where we get it). It’s just a small container of grass, the cat eats it and it aids in digestion. You have to change it regularly. Fifth, we sometimes add probiotics to her food which are digestive enzymes. They come in powder form or liquid in which case you add it using an eyedropper. Finally, we try to avoid giving the cat too much food at a time. She doesn’t seem to regular her eating and as a result, when she throws up there is a lot to clean up. Giving her a little bit multiple times a day seems to help, and at least cut down on how much we have to clean up. That seems like a lot of work to keep the cat healthy. It has now been 16 days since I had my fourth hip surgery (but first on my right hip). I can only remember bits and pieces of my recovery from the first three so I thought I’d write down this time what it has been like. First, I was never really in that much pain. True, I was walking a lot slower than normal and I took the occasional Ibuprofen, but it hurt a lot more when I got my braces put on my teeth earlier this year. I still can’t do a lot (i.e., have to walk slowly) but I can get around just fine. Second, the first week I was walking around on crutches and I had to adjust my posture. That ended up putting a lot of strain on other parts of my body because it was unnatural for me. Thus, I felt uncomfortable in my back and in my left leg because of the awkwardness in how I was standing. I was anxious to get off of crutches because of that. Third, I sat around on the couch for a long time each day. That wasn’t good for me, even though I had to rest. This couch of ours is starting to lose its cushion-firmness and as a result, after a long day of sitting around, my back got sore. Turns out sitting around all day is not good for you. Fourth, and for the first time, I was seriously dehydrated which made my bowels “move slowly”. That was unpleasant; it felt like I had something in my stomach for hours after I ate and that my pants were too tight. Also, bowel movements were kind of painful. For the first time in my life I had to buy stool softener. Finally, after my other surgeries I shifted a lot of my weight to my right leg which was my “good” leg (in reality, my better leg). But after this one on my right hip, I have to transfer a lot of the work to my left leg which never really got better. That means that my left leg still hurts and the additional weight and movement and strain twinges more than I ever had in the past because the three surgeries didn’t really get rid of all of my left hip pain. So, that’s what I’ve been up to after my latest surgery. Here my final set of predictions from 20 years ago. Let’s see how accurate I was. The predictions are in italics, my comments are in blue text. a) Four sports or entertainment activities I am involved in are a summer baseball league, and a minor hockey league in the winter, playing video games and being involved in a Nintendo club in which we show off our prowess and skills, and sporadically going to movies once in a while and criticizing them and giving them my rating on a scale of one to ten. Well, these are completely wrong. At 35, I play neither hockey nor baseball. I did in my 20’s but not in my 30’s. I wouldn’t mind taking up either one. I don’t play video games of any sort. I have a Nintendo Wii but never played much (although Punch-Out for the Wii was a ton of fun). Finally, I do sporadically go to movies and I do criticize them. Sometimes this is done in a blog post, but mostly it’s done in my head. b) Two facilities close to where I live are a hockey arena a few blocks away and a baseball park near where I live. Wrong. Neither of those are close by. There is a high-school football field a mile from where I live, though. a) I am assuming that I am not married. I spend approximately 25% of my time with family such as cousins and family get-togethers. With my friends I spend about 50% of my time going to baseball or hockey games. The rest I have to myself to do things. I am married and I don’t spend that much time with family or cousins at get-togethers. I virtually never play sports with friends, but I do hike a lot with the wife in summer. I also hike with friends sometimes, and also alone. So, while wrong, I guess this is not completely wrong. The rest of the time I do have to myself, but I spend it reading, watching Netflix or programming. b) Most of my friends I still have since I was in high school. Others I have met at work and still others I meet through activities such as bowl-a-thons. I have some friends I had while in high school (and through church back in the day) but because I live so far away, I don’t see them often. Even if I lived closer I still wouldn’t see them that often. c) While my friends are not innumerable I do have quite a few. I have about 6-8 close friends and about 20 acquaintances who I know. d) I don’t have any children. I have a dog and a cat. The dog is a black lab who is a good guard dog. Her personality is good-natured, nice to hose she knows, and mean to those she doesn’t know. My cat is black, short-haired, and has a really good personality. Both of them get along well and with each other. 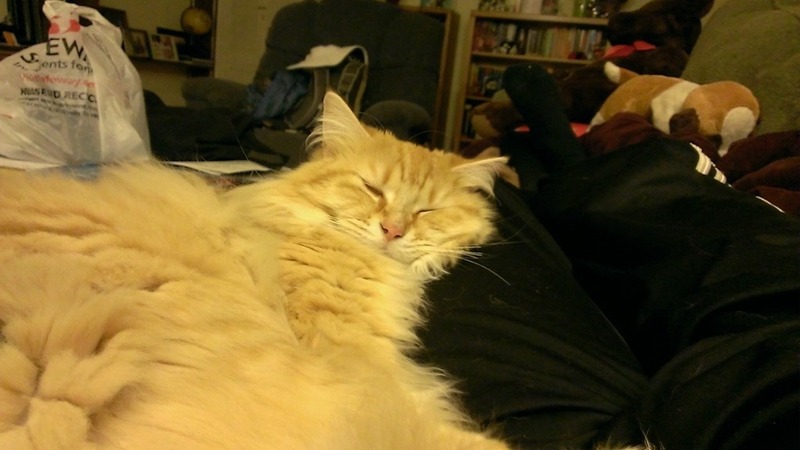 Cat is orange, not black; short-haired, not long haired; but does have a good personality. Probably wouldn’t get along with the dog if I had one. As you can see, some of my predictions were right, others were wrong. A lot of my predictions were based on my life at the time and projecting them forward in time on the assumption that my life would be the same. And in some ways, it was true. And in others, not so much. So what does this mean? Does it mean that personalities are stable throughout our lives? Does it mean that we don’t change as much as we think? Does it mean that we can’t predict the future in all things, but we can in some things? I think I will make a fresh set of predictions for when I turn 55. It’ll be fun to look back at that point and see how I did. What else did I get right or wrong from my predictions 20 years ago? Let’s continue on from my predictions I made from my 10th grade class Skills for Independent Living. While I nailed what type of job I would have and even the company, I was off on my income. What else did I get right? My original predictions below are in italics and my comments are in blue text. a) At the age of 35 I hope to be living in either California or in Manitoba (still). The reason I would like to be living in MB is that while it is still cold, it is home. b) The Californian climate is hot and dry in the summer and quite warm and wet in the winter. I would like to be located near Los Angeles but preferably 50 miles away from it. I left Manitoba when I was 28 despite it still being home. In fact, I left MB originally when I was 22 to go live in England. But nor did I end up in California, either. Instead, I moved to Washington, a state whose climate is substantially different from either of the two places I predicted. However, this one was almost true. In 2007, I had a job offer from a company in the California which I turned town in order to stick with Microsoft so I was nearly correct on this prediction. However, the job was in the Bay Area near San Francisco which is 400 miles from Los Angeles. At the time I wrote that prediction, I liked the city of LA. I don’t like it anymore, so living 50 miles from LA is probably correct. a) I would like to be living in a rather large house, but not too big, out in the country or in the suburbs. It would be a single family house. b) I share my house with a dog, a cat and maybe a roommate. I live in a single family home but it is not large. It is in the suburbs of Seattle. I don’t have a dog but I do have a cat and a wife which is better than a roommate. My writing style back then could have used some improvement. Why did I use the word “rather” in the sentence above? Ugh. At the age of 35, I hope to own a car that has a good engine, looks nice on the outside and is efficient on gas. Some of the features I would like it to have are air conditioning, dual air bags, telephone, hopefully a TV and VCR for long trips, cruise control, a portable computer and economic fuel mileage. And, if they are invented by then, I wouldn’t mind having a flying car that has all of the above features. I have a Toyota Corolla; while others may not agree, I do like its look on the outside. It is efficient on gas, it has air conditioning and dual air bags. I don’t need a phone in the car as I already have a cell phone, nor does it need a portable computer, TV or VCR because that’s what tablets are for. Flying cars aren’t invented yet. They probably won’t be invented by the time I am 55 or even 75. Those predictions were reasonably accurate. I have one more set to go, and that’s for my next post. Continuing on from my previous post about predictions I made when I was 15, next is where things get interesting. The below in italics is what I wrote, and the stuff in blue text is my comments. rather large but it is a big, powerful company. Correct, mostly. I work at Microsoft and while it does have some large buildings, most of them are small. Put them altogether and it is at least 32 stories. It is downtown and receives a lot of business in the way of computers (or, if I am a lawyer, in a law firm with the above mentioned). I work in my own office developing different computer programs and fixing other people’s computers which have broken down. Correct! I’m not in a law firm but I do have my own office and I develop computer programs. I don’t fix other people’s computers, instead, I work on software to prevent them from breaking in the first place (by stopping spam and malware). The company where I work is not downtown, however (while they do have offices downtown, they are not where I work). I sit down some of the time to do some of the work, and get to walk around to test out other programs and to troubleshoot computers. Correct! The part about troubleshooting is wrong but it is right in the sense that I talk to members of my team to see how things are going. My salary is about $228,000/year because I have to do so many programs and make business deals and I am near the top of the corporation. Totally wrong. My salary is not close do that, nor am I near the top. c) I work both alone and as a team. As a team I work on ideas for the next programs and working business deals such as mergers and supplies. This is so correct it is disturbing. I don’t work on mergers but I do deals to acquire services from third parties. Alone I work on developing the programs and showing them to my few superiors and suggest improvements. Correct! Although I work as a team so there is a lot of collaboration between myself, my team members, and my superiors. I both give and receive feedback on my designs as well as others’. The corporation is a large one, preferably Microsoft. Bam! Nailed this one 10 years before it actually occurred! Most of my co-workers are my age or older and have high levels of education. Most of them have Masters degrees or bachelors in computer science. Correct, although the number of people with Master’s degrees is not that high. But a lot of them have degrees in computer science or engineering. At the time I wrote this I thought I would pursue computer science but instead I graduated from computer engineering. My superiors are the president of the company plus a few others. This one I got wrong. I serve computer companies and customers with computers which do not work properly. True, but the scope of my statement is too narrow. We serve customers who don’t have email filters, and without our product their computers would not work properly. So, those are predictions about my work that I made 20 years ago. Some I got wrong, others I got right, and some I got extremely right. And, I wasn’t even trying to do a mentalist prediction at the time. I wouldn’t become interested in magic until a couple of months after I wrote this paper. A bunch of my friends were like “Duh, what an easy question! 20%!” But I said “No, it’s 25% because you have to increase it by a larger amount because you are now dealing with a new starting point.” I don’t know how many people got that question right besides me, but it wasn’t the majority. But that’s now what I want to talk about. Instead, later in the year we had to do a class project “When I am 35.” The idea was to envision what our lives would look like 20 years into the future. A couple of years ago I found that project in my parents’ basement. I wrote it down so I could blog about it when the time came. i. 20/20 vision by way of radial keratotomy – Wrong on this one. I looked into LASIK surgery a couple of years ago to correct my vision but my corneas are too thin. My odds of success are only 50%. If I’m going to have my eyes done, I want better odds than that. Oh, and radial keratotomy is now obsolete. ii. Good athletic ability – Somewhat wrong. I enjoy sports but I was never that good at them (although in sponge hockey I had some great games). I do go hiking long distances and I am pretty good at that. iii. Always in good health – Success! While my hips have deteriorated and most of my muscles are tight, I am in pretty good health due to a combination of diet, exercise and living location. Out here on the left coast I don’t get as many seasonal allergy problems. iv. Fairly wealthy (approx. $4.5 million) – Way wrong on this one. v. To be philosophical – Partial success! I am not philosophical but I have learned a lot about neuroscience and behavioral psychology. That’s even better. vii. IQ of 150 – Way wrong on this one. Your IQ is mostly inherited and there’s not much you can do about it. Luckily, it doesn’t matter most of the time anyway. viii. Good at communicating – Success! I’m not that good a talker but I am a good writer. ix. Get along well with others – Success! I get along with most people! x. Type 70 words per minute – Success (I think)! I am not sure how fast I can type, but that sounds about right. Overall, that is 5/10. Not bad for something 20 years in advance. In my next post, I’ll look at some more predictions. Today, I had my fourth hip surgery. However, the previous three were on my left hip but this was the first time on my right hip. People sometimes ask me what happened to require me another surgery. The answer is that even three years ago I knew I had to get it done; indeed, my right is my “not-as-bad” hip, not my good hip. I decided that this year was the year to get it done because I was getting tired of it hurting so much. They told me after that they shaved away a bump on my hip bone and that I probably had it as a teenager. I always like to write down how much I remember from surgery because I remember so little of my first two. So, here goes, here’s the sequence of events today. I couldn’t eat anything today before surgery. That’s to prevent you from having a reaction to any medication and throwing up while unconscious and then choking on your own vomit. I was hungry by the time I got to the surgery center. I wanted a hamburger. We got to the doctor’s office around 12 pm, and after waiting for 20 minutes in the lobby they took me into the back, along with the wife. They took my blood pressure (116/69) and then had me change into a hospital gown with a robe. The wife and I yammered for the next hour or so until 1:30 pm rolled around but a nurse popped in every 15 minutes or so. Finally, at 1:30, the doctor came in and explained what was going to happen in the procedure as well as what medications I would be given. He also put his initials on my right hip to ensure that he wouldn’t accidentally work on the wrong one. The anesthesiologist came in next and explained her role in the surgery and we went through and answered the same questions. They had me describe my procedure in my own words, and on what body part. A nurse came in and once again ran through the checklist. After that, I said goodbye to the wife and the nurse led me into the operating room. I was carrying my IV solution and bag in my other hand (without the IV inserted). In the operating room, they had me get onto the table and I got adjusted into the correct position; I had to scootch around a bit. They put on a heated blanket onto me which was so comfortable. Next, they put an oxygen mask on me but I found it hard to breathe. I coughed a couple of times but kept the mask on. … I was in the recovery room. I woke up and I felt super sleepy, like I wanted to go back to bed. I wasn’t nauseous, I wasn’t dizzy, I simply felt like I wanted to sleep. Oh yes, I was also itchy on my nose or face (I think; I don’t remember what part was itchy, I just know that I wanted to scratch something). I was kind of lying on my back but partially inclined. Here’s where I have some missing time. I was taken from the recovery room back to my original prep room but for the life of me, I can’t remember how I got there. Did I walk? Or was the chair was in on wheels? This part is drawing a blank. Even as I type this, I am making up memories that I did indeed walk there, but I also remember being taken there in a large wheelchair-like device. Dang, this one I am not sure about. They asked me if I wanted anything to drink. They ran down a list including multiple options but the only ones I remember are tea, Coke, Diet Coke and Ginger Ale. I said I wanted Coke; they misunderstood me because they repeated Ginger Ale, but no, Coke is the one I wanted. They also ran down a list of things to eat including animal crackers, soda crackers (saltines), pretzels, or a few other things. I would have wanted Ritz crackers but since they weren’t on the menu I took saltines instead. I got my Coke and crackers and finished them; I was hungry as I hadn’t eaten all day, but surprisingly not too hungry even though I hadn’t eaten all day. After my first chow down, the wife came in and sat with me. They brought me my second Coke and crackers which I wolfed down, too. I then got dressed. I put on my undergarments and pantaloons, and then the wife put on my socks. I put my T-shirt on and thin jacket, and then the wife put on my shoes. They then brought in a wheelchair, I got in, and then they sent me out a side door. Oh, yeah, during this time I was in some pain. My hip hurt, it felt like someone had punched me there. Most of it was in the front of my hip but some was in the side. It was hard to walk and impossible to tie my shoes. They gave me some painkillers for it. They took a while to kick in but they did help. The wife rolled the car around and I got in, then she went back inside to get my parents. We then proceeded home, roughly 5 hours after I got there. I currently feel okay, just a little sleepy. But I’m not sick (like the first surgery), not sore in the legs as much (like my third surgery) and my throat is mostly okay (not like my first surgery). I will probably go to bed early tonight. And that’s what I did today for my fourth hip surgery.